The moment I walked into the gallery and saw the photographs, I got that particular feeling—a sort of current—that comes from seeing very good art. Becton’s photographs are large, and they feature surreal montages of old houses, old doors, peeling paint, still lifes, and decay. Water figures prominently in all the photographs as it comes into a room or laps at the edges or is just plain there. The palate is muted, almost soothing, yet there is also a certain sadness in most of the photos. If Andrew Wyeth had had a more vivid imagination, this is how he might have painted. The woman at the desk told me that she’d like to step into one of the photographs. My response: “Only if there was a quick way out.” All that water coming into the rooms has a, well, unsettling effect. The exhibit runs until March 26, and Clif and I plan to go back for a second look. 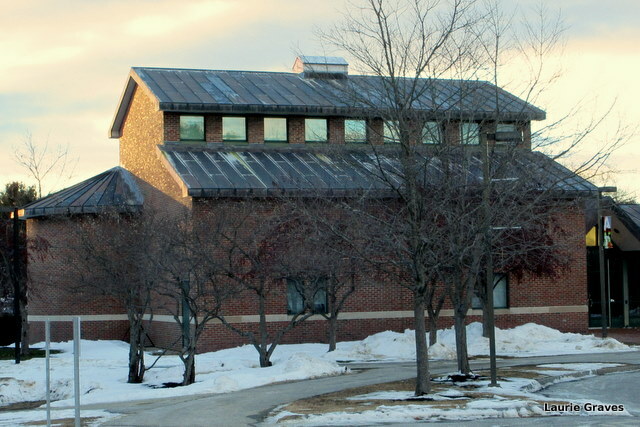 Bates College is only thirty minutes or so from where we live, and for us it is an easy trip. Readers, if you like art and live within driving distance, then I urge you to go see this exhibit. Admission is free, and on Monday and Wednesday the museum is open until 7:30. After the exhibit, we went to one of our favorite restaurants, Fuel, which specializes in simple French cooking, “country French food with no attitude.” The food and flavors at Fuel have a subtlety missing from most restaurants in Maine, even the good ones. Fuel also makes delicious cocktails, which I cannot resist. 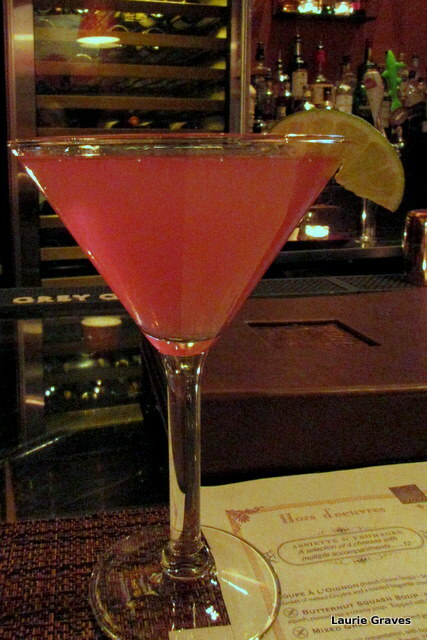 First I started with a cocktail, a cosmopolitan. As Clif was driving, he had a beer. 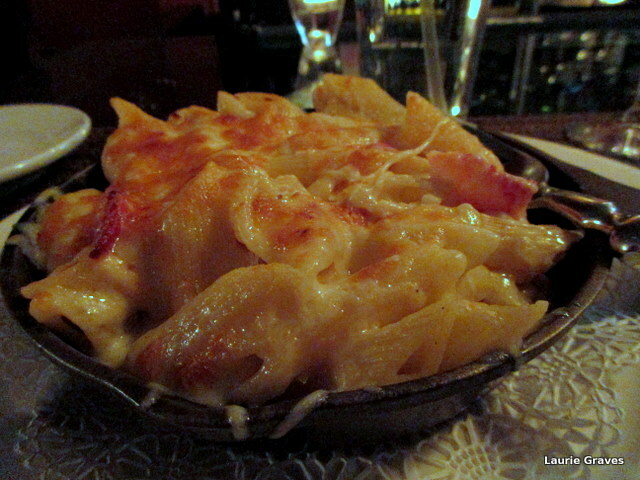 I had lobster pasta and cheese, a lovely blend of cheeses and lobster—I found three whole claws in my dish. 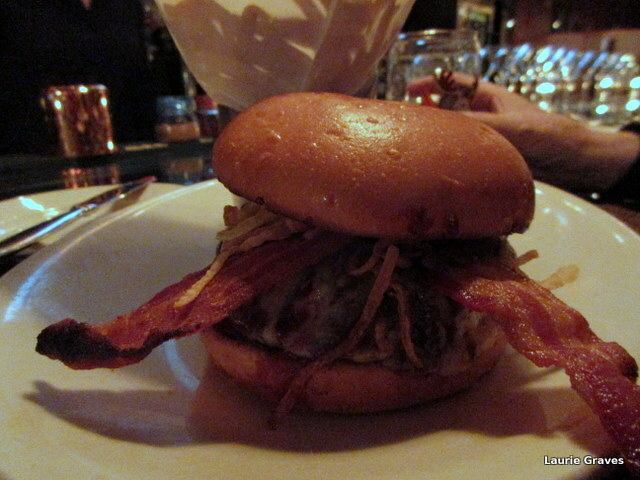 As we never eat beef at home, Clif ordered a burger and fries, a treat for him because he has it so infrequently. Was there room for dessert? You bet there was. 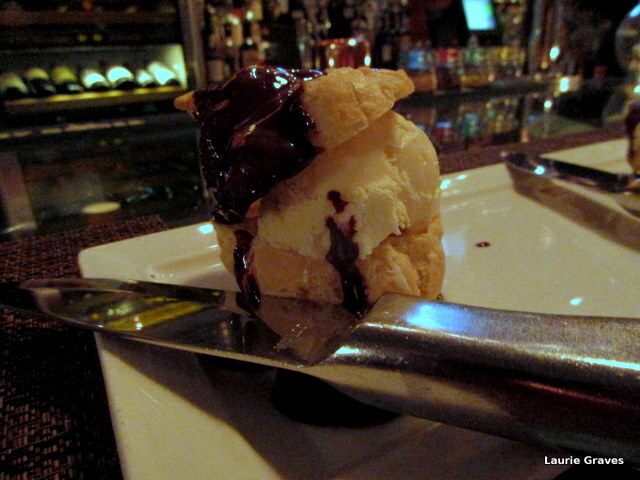 We ordered profiteroles—a fancy word for cream puffs—filled with vanilla ice cream and drizzled with chocolate sauce. A sweet ending to a fine day. Shannon, a very good day. Yes, surreal. And seeing the actual photos gives you a truer sense of how much work must have gone into each piece. The layering and the variety of media is astonishing. Judy, fuel is a mighty fine restaurant. My favorite, in Maine. Lewiston is a charmless city, but for me, food (and art!) are the thing. Let me know if you come to Lewiston. Judy, glad to make you laugh 😉 Despite Maine’s “quaint” reputation, many of the small cities in central Maine could be described as charmless. They were once fueled by the great factories, and nothing has come to fill the economic niche. As a child of central Maine, I could write a lot about this, but I won’t. On a more positive note, many of the small cities have begun to realize that trying to lure big businesses with tax breaks is not a recipe for success, and they have begun to encourage more local businesses, ones that actually want to stay here. My own birth city, Waterville, is going down a very interesting route, one that I will probably write about soon. Sounds like a truly great day. I’d take the lobster pasta over the hamburger, though I’m not as beef-deprived as your husband. What an enjoyable outing. Good art and good food; what more can one desire? Right you are! Who could ask for anything more? Wow. Fuel is right–it looks like those meals would provide enough calories to stack a few cords of wood! Delicious and decadent. Brenda, you got that right! Enjoyed the post! Iam not familiar with Becton’s work, but will google it. Thanks for sharing. A very talented artist. I hadn’t heard of him, either, until I went to the exhibit.